6ft Air Hockey Table H6E-240 from BCE. Powerful internal electric-fan creates a real air-cushion under the puck! Our BCE 6ft Hockey Table (code H6E-240V) is a fixed-leg air hockey game that is great fun for all the family. The powerful internal electric fan creates an air cushion on which the puck can move at high speed. This is a robust version of the popular air hockey game found in amusement arcades. This is a robust version of the popular air hockey game found in amusement arcades. BCE-Riley is a major UK manufacturer of games tables for both professionals and the home, and are also the official table supplier for the snooker world championship, so you know you are getting a reliable product from a first-rate manufacturer. 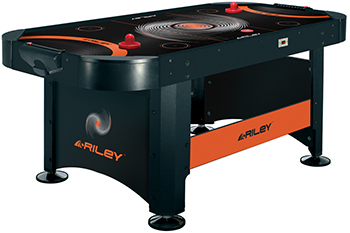 This air hockey table is large and powerful enough for a good and skilfull hockey game, even if four people are playing together. The 240v electric fan generates enough air flow to keep the puck moving quickly with minimal resistance, so it is possible to get a quick and thrilling game going. What we particularly like about this table is that it combines good performance with a very competitive price. Also, it's strong design means that it can be used in demanding environments. We sell additional pucks and paddles (also known as 'pushers' or 'strikers') as accessories (click on the tick boxes above before clicking 'add to cart' to order these). By adding two additional paddles, you can convert this into a four-player game - ideal for when the whole family gets together.